BUIES CREEK – Daniel Smith accounted for four touchdowns and Campbell defeated North Alabama 30-7 Saturday night in a matchup of future Big South Conference rivals. 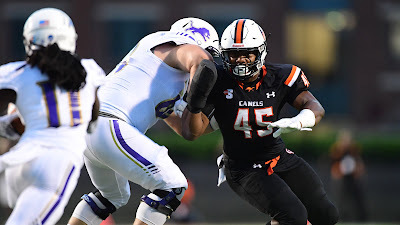 In front of the eighth-largest crowd (6,352) in Barker-Lane Stadium history, Campbell led 23-0 after one quarter and improved to 4-1 for the first time in the program’s modern era (since 2008). Smith ran for a first-quarter score and connected with three different receivers for scoring passes. A sophomore from Leesburg, Va., Smith finished with 115 yards on the ground for his seventh career 100-yard rushing performance, while completing 16-of-24 passes (to seven different receivers) for 163 yards. 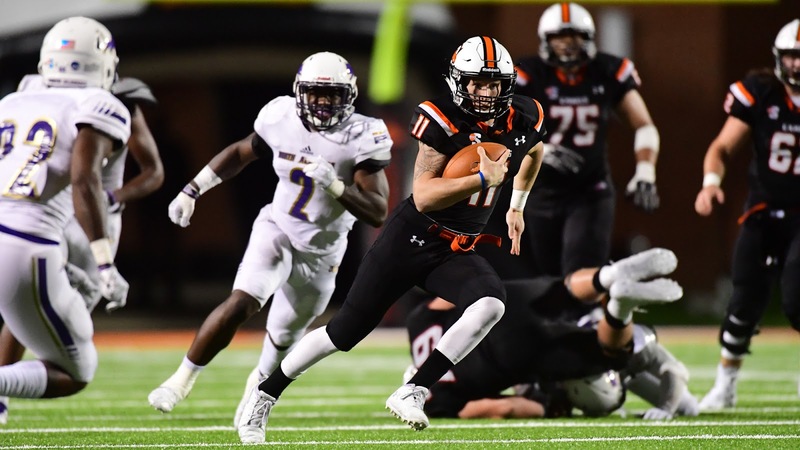 Campbell scored on three of its first four drives and to claim its early lead, and twice stopped the Lions on first-and-goal from the one-yard line. The Camels (4-1) finished with just a 352-322 edge in total offense but recovered two Lion fumbles in the red zone to win their second-straight game. Rocky Reid added 64 yards on 22 rushes for the Camels, while Antonio Whitehead had four receptions. Senior linebacker Jack Ryan had 15 tackles, including eight solo, and in the process set a school career record with 276 stops. North Alabama quarterback Christian Lopez completed 15-of-30 passes for 159 yards and Damon Cox added 95 yards on 12 carries. Jakobi Byrd had eight catches for 73 yards. Joshua Amanfo led UNA (3-2) with 10 tackles. The Camels took the opening kickoff and drove 73 yards on seven plays, capped by Smith’s 24-yard scoring pass to Aaron Blockmon. On UNA’s opening possession, quarterback Christian Lopez could not handle an errant shotgun snap and fell on the ball in the end zone for a safety. It was the first safety for the Campbell defense since the 2013 season. Smith’s 22-yard keeper ended a 9-play, 66-yard march and pushed the Camel lead to 16-0 with 3:16 left in the opening quarter. Jaquan Brooks’ 19-yard punt return set up Campbell with a first down on the UNA 48 and four plays later, the Camels were back in the paint when Smith hooked up with Caleb Snead on a 22-yard scoring pass. Midway through the second quarter, the Lions drove 68 yards to set up a first and goal on the Campbell one after Lopez found Jakobi Byrd on a 19-yard reception. However, Jack Ryan tackled Lopez for a five-yard loss on a run-pass option, and on third and goal, another bad snap hit Lopez in the foot and Justice Galloway-Velazquez recovered to keep the Lions off the scoreboard. Campbell held a 253-135 advantage in total offense in the opening half and converted 4-of-7 first downs. Smith accounted for 202 yards in the first half, 141 through the air while completing 12 of his first 17 passes. The Lions got on the board with 5:33 left in the third quarter on Damon Cox’s 13-yard run that completed a 12-play, 82-yard drive and cut Campbell’s lead to 23-7. Campbell answered with an 11-play, 60-yard march to stretch the lead to 30-7. Smith ran 27 yards on a third-and-10 near midfield to give the Camels a first down on the Lions’ 21. Five plays later, he found Zach Roderick on a 9-yard scoring pass in the left corner of the end zone. In the fourth quarter, UNA’s Terence Humphrey was stopped just short of the goal line to give the Lions a first down. On the ensuing play, Deontae Henderson knocked the ball out of Humphrey’s hands and Dorian Jones recovered. The Camels host Wagner next Saturday (Oct. 6) in a 2:00 p.m. kickoff.